There are certain circumstances where chapter 13 makes perfect sense even though there may not be a lot of debt being repaid. A perfect example of this would be if a person’s driver’s license is suspended due to failure to pay parking tickets to the City of Chicago. Let’s say this person needs that vehicle to get to and from work. If the debtor’s license is suspended, chapter 13 is going to be the only option to regain driving privileges other than working into an installment payment plan with the City of Chicago. Often times, the city will not be amenable to a payment plan and the debtor is forced to either borrow a significant sum of money from family and friends or take the chapter 13 option. Let’s look at a recent example. The debtor had $3000 worth of parking ticket violations from the City of Chicago. His license had already been suspended and he was currently driving on a suspended license. He was in desperate need to regain driving privileges. One of his co-workers had mentioned chapter 13 to him and he inquired as to whether or not he qualified. Since he had a job, and since he had the ability to repay a portion of his debt over time, he was eligible for Chapter 13. Once the chapter 13 bankruptcy case was filed, the debtor’s driver’s license was reinstated. The case will now remain open and the debtor’s driver’s license will remain in good standing provided he continues to make the regular chapter 13 plan payment. In this particular case, the plan payment was only $125 per month. This was definitely something that the debtor could afford and can continue to pay for years and years. Now the Chapter 13 trustee might question the attorney’s fees in such a case. After all, the typical chapter 13 attorney fee in the Northern District of Illinois is $4000 over the life of the case. The trustee can argue that the amount being paid to the attorney is excessive in light of the amount of total debt. However, the courts as recently as last week, have shot down this argument. Working out of the flat fee model retention agreement, the court reasoned that the debtor was not being forced into a chapter 13 in an effort to pay higher fees. Further, the flat fee arrangement for fees is approved by the judges in the district. The real question is, if you are someone who is struggling financially, what is the nature of the debt and what is the amount of the debt? In many circumstances, the type of debt will dictate whether or not a chapter 7 or a Chapter 13 is applicable. When we are dealing with parking tickets and driver’s license suspensions, the only viable option from the bankruptcy standpoint would be a Chapter 13 reorganization. As long as the debtor continues to make timely payments to the Chapter 13 trustee, his driver’s license will remain in good standing. 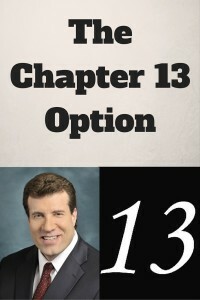 Chapter 13 fulfills the debtor’s goal of maintaining a valid driver’s license. Please See Listing Of National Chapter 13 Bankruptcy Trustees for more information.